For the Mexican drink, see Champurrado. 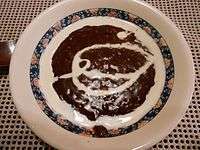 Champorado or tsampurado (Spanish: champurrado) is a sweet chocolate rice porridge in Philippine cuisine. It is traditionally made by boiling sticky rice with cocoa powder, giving it a distinctly brown color and usually with milk and sugar to make it taste sweeter. However, dry champorado mixes are prepared by just adding boiling water. It can be served hot or cold and with milk and sugar to taste. It is served usually at "merienda" or tea or snack time in the afternoon and sometimes together with salty dried fish locally known as tuyo. The pudding becomes very thick and the lighter milk helps to "loosen" it. 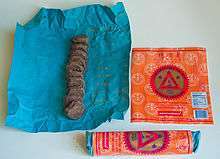 It can be eaten as breakfast or dessert as well. Tinughong is another variant of champorado in Visayan-speaking regions which do not necessarily include chocolate. It's usually made from old cooked rice boiled again with sugar, resulting in a sweet gruel. Coffee or milk may sometimes be added. Its history can be traced back from Mexico. During the galleon trade between Mexico and the Philippines, there were Mexican traders who stayed in the Philippines and brought with them the knowledge of making champorado (this is also the reason why there is Tuba in Mexico). Through the years, the recipe changed; Filipinos eventually found ways to make the Mexican champurrado a Philippine champorado by adding rice. 1 2 Almario, Virgilio, et al. 2010. UP Diksiyonaryong Filipino, 2nd ed. Anvil: Pasig. ↑ Rose Catherine S. Tejano (16 December 2012). "Sikwate Stories". The Bohol Chronicle (344). ↑ "Bisaya English Translation of "tinughong"". Cebuano Dictionary. Sandayong.com. Retrieved 28 July 2016.